In our readings this Sunday, we hear about the sanctity of marriage; the enduring bond between a husband and wife as God's plan from day-one. In our first reading from the very first book of the Bible (Genesis 2:18-24), we hear God say, "It is not good for the man to be alone". Unlike the animals, she is of his flesh, his coequal partner. We are created to live in covenant relationship with God and with one another. The LORD God said: "It is not good for the man to be alone. I will make a suitable partner for him." So the LORD God formed out of the ground various wild animals and various birds of the air, and he brought them to the man to see what he would call them; whatever the man called each of them would be its name. The man gave names to all the cattle, all the birds of the air, and all wild animals; but none proved to be the suitable partner for the man. So the LORD God cast a deep sleep on the man, and while he was asleep, he took out one of his ribs and closed up its place with flesh. The LORD God then built up into a woman the rib that he had taken from the man. When he brought her to the man, the man said: "This one, at last, is bone of my bones and flesh of my flesh; this one shall be called 'woman, ' for out of 'her man' this one has been taken." That is why a man leaves his father and mother and clings to his wife, and the two of them become one flesh. In our Gospel reading (Mark 10: 2-16), We hear Jesus' teaching on marriage and divorce and attitude toward children. Jesus goes all the way back to the creation account in Genesis to describe God's plan and intent for us. He then adds the reverence for children as part of that plan. The Pharisees approached Jesus and asked, "Is it lawful for a husband to divorce his wife?" They were testing him. He said to them in reply, "What did Moses command you?" They replied, "Moses permitted a husband to write a bill of divorce and dismiss her." But Jesus told them, "Because of the hardness of your hearts he wrote you this commandment. But from the beginning of creation, God made them male and female. For this reason a man shall leave his father and mother and be joined to his wife, and the two shall become one flesh. 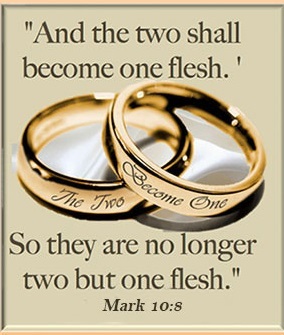 So they are no longer two but one flesh. Therefore what God has joined together, no human being must separate." In the house the disciples again questioned Jesus about this. He said to them, "Whoever divorces his wife and marries another commits adultery against her; and if she divorces her husband and marries another, she commits adultery." And people were bringing children to him that he might touch them, but the disciples rebuked them. When Jesus saw this he became indignant and said to them, "Let the children come to me; do not prevent them, for the kingdom of God belongs to such as these. Amen, I say to you, whoever does not accept the kingdom of God like a child will not enter it." Then he embraced them and blessed them, placing his hands on them. In our Epistle reading (Hebrews 2;9-11), we learn that Jesus was made one of us ("lower than the angels") so that he might lead us to salvation. It is through his suffering that he consecrates us, that is he dedicates us to the sacred purpose of service to God. Jesus makes clear to us in today's Gospel that marriage is a union made by God and is unbreakable. God is always the third party to the union of every husband and wife. It is within the cocoon of this union that children are brought into the world and nurtured. This has been God's plan since creation. It is intended for our happiness.